Pliers that can fit around a 1-inch pipe? Hell yes. These are the pliers you want when you get stuck with a strange bolt. May 2014 although I had previously had one for about three years before it was stolen. Wide-mouthed pliers that can get around a 1-inch pipe. It can wrap around some tough jobs and still grip well. Serious vice-grips. Not a full-sized pair but tough, especially given the way they fold away. 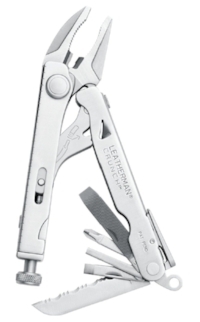 Typical Leatherman assortment; phillips, two flatheads, saw, file. Those one-of-a-kind (for a multi-tool) vice-grip, wide mouth pliers. It’s a little short on tools. I know they didn't have much space and they chose the best tools with that in mind but I wish they had made it more robust in general. I haven’t found any multi-tools with pliers like these. Most of the time when I’m stuck using pliers in a multi-tool it’s because I need to remove a bolt, not to rewire something. Because I like more screwdriver choices and scissors I carry a Surge instead. The Crunch stays in the car, though and definitely goes on boat or camping trips.